Shiva is an emotional and spiritual bridge. It is a bridge that begins to span the great gulf that has opened up in the life of someone who has lost the closest of relatives: a spouse, parent, child or sibling. How does one begin to move from the life-arresting darkness of loss to a resumption of the normal, everyday living of a life that will never quite be the same? The answer is shiva. Shiva is a seven-day mourning period (the Hebrew word shiva means "seven"), that commences immediately after the burial of a loved one. For seven days mourners remain at home, sitting on low stools, and begin a journey of reflection, grief, silence, comfort, prayer and integration. During the week of shiva, extended family and friends of both the mourner and deceased come to comfort the mourners. During this week, a mourner is referred to as someone who is "sitting shiva" and their house is known as a "shiva house." The seven-day shiva period begins immediately after the burial is complete and concludes on the morning of the seventh day. Shiva takes place in the home of the person who passed away. Ideally, all mourners gather there for the week. If, for some reason, shiva can not take place at the home of the deceased, then mourners can sit shiva in their own homes. When mourners live in different states or countries, it is not uncommon for there to be more than one shiva home. There is an obligation for neighbors to provide mourners with their first meal when they return from the cemetery to the shiva house. This meal is a relatively simple one and is not intended to be a social gathering. Those who have prepared the meal may sit quietly while the mourners eat and only engage in conversation if the mourners initiate it. It is customary to include an egg or round cake as part of the meal. This represents the cyclical nature of life that though it inevitably includes death, also includes birth and the joys of life. Mourners sit on the floor, on pillows or on low chairs. A special candle is lit in the shiva home that burns for the full seven days. 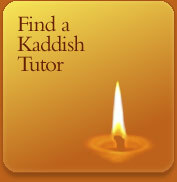 This candle is usually provided by a Jewish funeral home or a rabbi. The wick of the candle represents the body, while the flame represents the soul. The flame, like the soul, is always reaching higher and higher. The soul constantly yearns for spirituality, and a Jew must try to live a spiritually elevated life, constantly seeking to grow. During shiva, the soul of the deceased still maintains some presence in the shiva home. The candle provides a quiet reminder for the mourner of the soul's presence, and is a source of comfort to the departed soul. The mirrors in the home are covered. Shiva is not a time to be concerned for outward appearances, rather it is a time for inner reflection. Wash ones entire body as in a bath or shower. Rather, one only washes the hands, feet and face (and any other part of the body that becomes dirty) with cool water. Ideally, three daily prayer services are held in the shiva home. 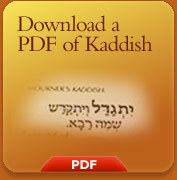 Signup for a free, personal phone tutor to learn more about the meaning of kaddish and the mourning customs.